Be a part of this historic new market launch from the CME Group. 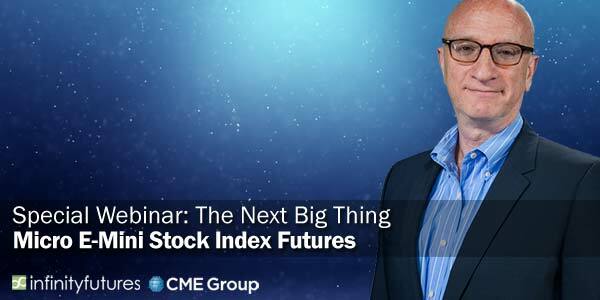 Mr. Lerman will present the new Micro E-Mini Stock Index futures products. David will go soup to nuts on: What are the Micros? Why trade the Micros? Who should trade the Micro? How it all works? Looking for a lower margin E-Mini? At 1/10th the size of a classic E-mini contract, Micro E-minis require less cash to enter the market with lower margins. Looking for a lower risk way to transition from ETF's to Futures? Trading ETF Futures offers a capital-efficient alternative to trade equity index benchmarks like the S&P 500 and Nasdaq-100. Many ETF and equity traders are hesitant to trade the futures markets due to the fear of the unknown. These smaller contracts can help mitigate these fears and provide for a lower barrier to entry. Start small and grow big! David will go over all of this and much more. Make sure to bring your questions on April 25th. This will be a great event! Infinity Futures, LLC is a wholly owned subsidiary of Transact Futures. ©2018 Infinity Futures, LLC. All Rights Reserved.